A jockey wheel is considered a plain and simple caravan item – but looks can be deceiving. Actually, it’s an integral caravan accessory as many avid adventurers experiencing a jockey wheel collapse while manoeuvring their caravan will attest. Jockey wheels are invariably subjected to substantial abuse and receive little ‘love and affection’. They’re also subject to a great deal of dust and road grime. Foreign particles find their way into the mechanisms of the jockey wheel and in particular cause corrosion and pitting of the ball race and its cup washers – components that take the load when you wind up the front of the caravan. This wear results in a grinding, rough feel as you turn the handle. Most jockey wheels can be refurbished and should be checked periodically for safe and reliable operation. You might also consider a way to keep moisture out of the mechanism if the device is left outdoors for prolonged periods. 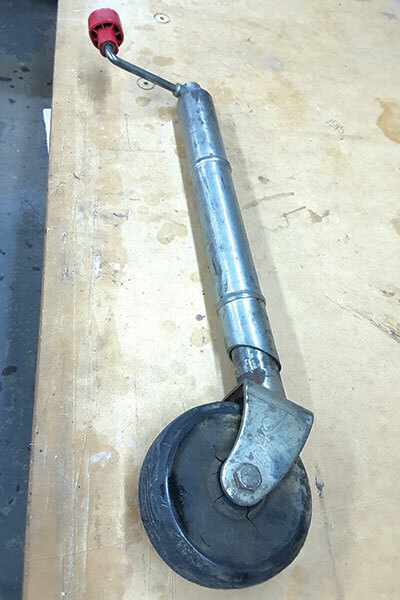 Failure of the top bearing, overloading and the inappropriate fixing of the holding bracket are the major causes of jockey wheel failure. Wheels (solid or air type) can also deteriorate with age or damage. 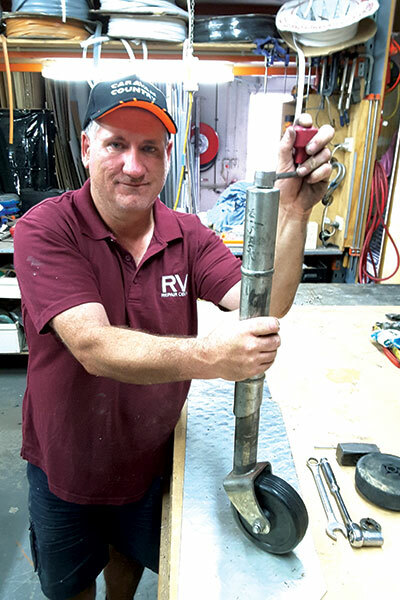 Some good news is that replacement parts are available at most trailer or RV repair centres. So follow these steps to properly maintain your jockey wheel, and it should give you years of loyal service. 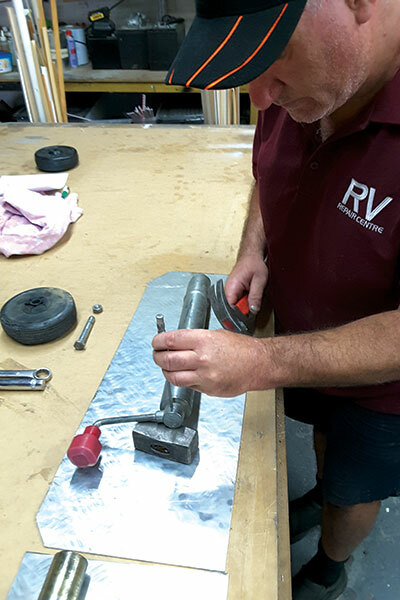 Remove the jockey wheel from the A-frame by ensuring the handbrake is applied and wheel chocks placed either side of the wheels. Place a suitable jack stand in a suitable location where the jockey wheel is mounted. Remove the jockey wheel and place on a sturdy bench as shown. Note: The actual solid jockey wheel within this image has extensive deterioration protruding from the axle shaft and will overtime collapse if not replaced. Removing the solid jockey wheel from the lower case requires a spanner at each side on most designs. Remove the wheel and inspect for deterioration and axle shaft wear. Replace any defective parts. 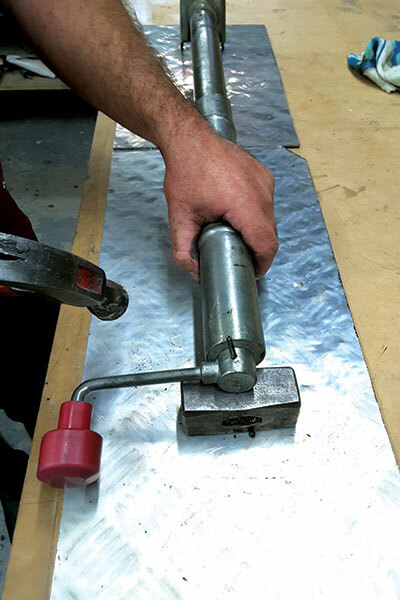 Handy hint: It’s preferred not to hold the casing in a vice to perform this task as the pressure applied may distort the outer case. Separate the upper and lower cases by winding the handle to fully extend the jockey wheel. The last few turns will require additional effort to release the worm drive shaft from its mating lock nut. Place the individual cases on the bench as portrayed in this image. Remove the handle by using a pin punch to remove the roll pin. Inspect for damage and replace if faulty. Handy hint: Place a support under the handle boss to avoid bending or breaking the handle as shown. 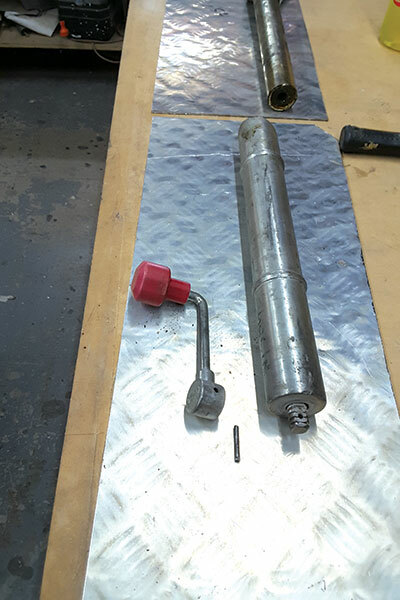 With the handle removed from the upper case use a plastic hammer and knock the worm drive shaft into the housing then remove the shaft as shown (image above). 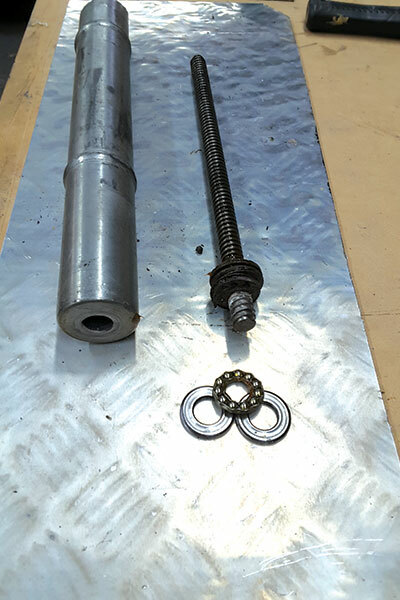 Image below depicts the worn bearing on the shaft and the new bearing replacement. Lift off the old bearing and washer, clean all parts. Check the worm drive shaft for defects, if okay replace with a new bearing with a smear of grease. 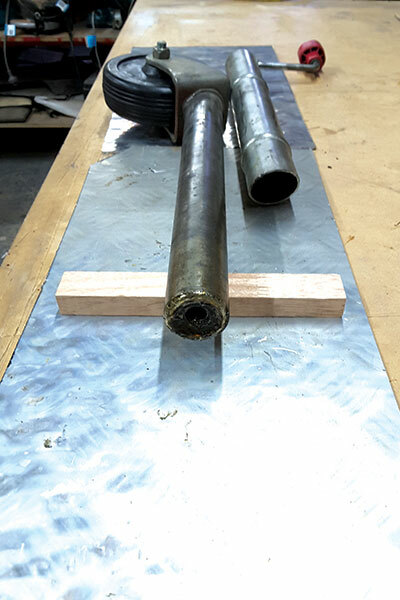 You’re ready to place the shaft back into the upper casing. With the upper case now assembled, clean and check the lower case. Check to ensure the fixed nut is secure and the internal thread is okay. Regrease the nut and worm drive shaft. 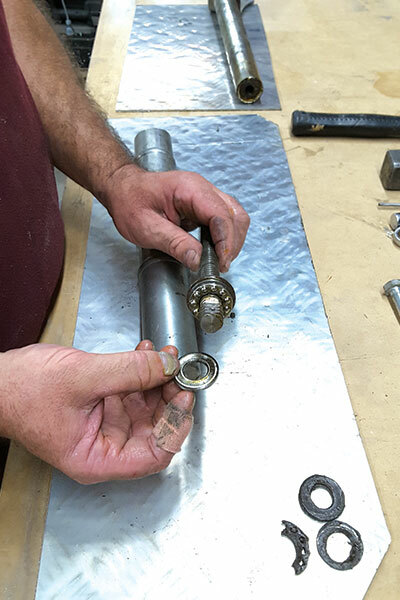 Handy hint: It is easier but not necessary to wind the worm drive shaft (by hand) into the lower casing without the top casing attached a turn, then place the top casing over the top. 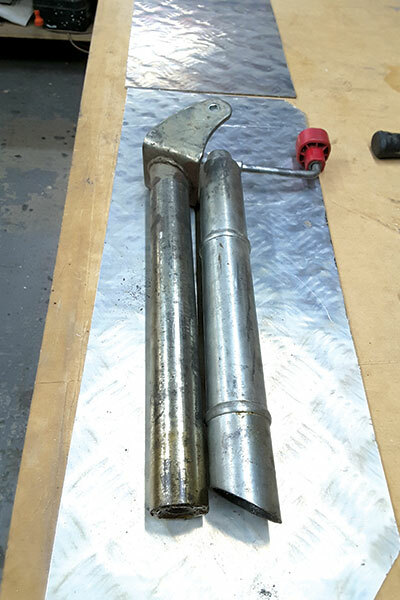 With the upper and lower cases reconnected, refit the solid wheel (smear grease on the axle shaft) re-tighten the axle nut to ensure the wheel is free to rotate and refit the roll pin into the handle as shown. Handy hint: Replace the roll pin if necessary. 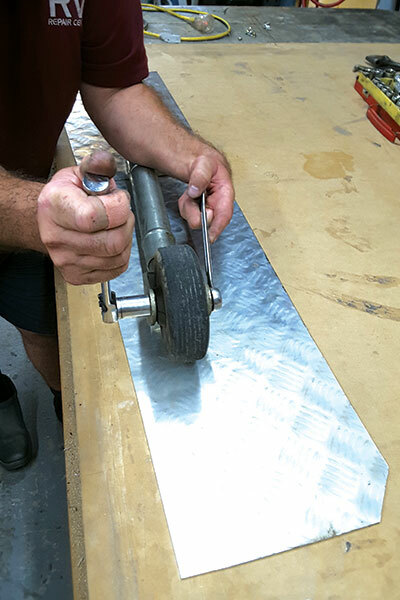 With the jockey wheel reassembled, ensure the road wheel is free to rotate and swivel. Wind the handle in both directions to ensure smooth operation throughout the operating range. Your jockey wheel is now ready to reinstall. Remember: If the jockey wheel is wound up too far it will disengage the top case from the lower case.